Featured on the cover of a recent issue of one of chemistry’s most notable journals was a diagram of lead iodide molecules assembling into a complex photovoltaic material. It referenced an article inside the magazine written by a group of scholars from The University of Toledo. Chemistry of Materials is a peer-reviewed scientific journal featuring fundamental research in chemistry, chemical engineering and materials science. 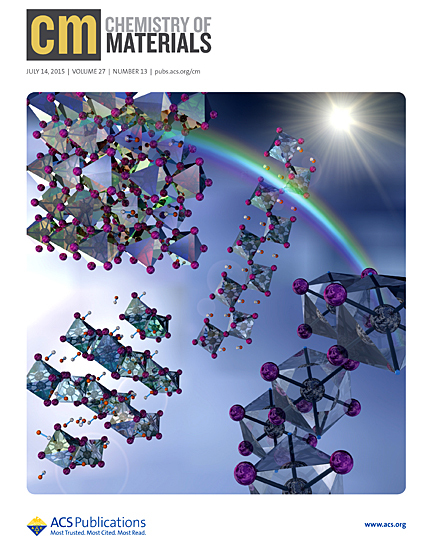 The article and cover art in the July 14 edition focused on the formation of revolutionary material that is exciting the photovoltaics community: so-called perovskites. This material, applied to solar energy conversion only in the last five years, has quickly demonstrated high efficiency for generating power from solar energy. The project has been worked on for the past two years in UT’s Wright Center for Photovoltaics Innovation and Commercialization, which was started in 2007 to strengthen photovoltaic research and manufacturing in Ohio. Drs. Michael Heben, Randy Ellingson and Adam Phillips of the Department of Physics and Astronomy, along with students Suneth Watthage, Zhaoning Song and Brandon Tompkins, contributed to the research and writing for the article. Heben, UT professor of physics and the Wright Center’s endowed chair, explained that perovskites have attracted so much attention for photovoltaics because they have only been around for a fraction of the time of other photovoltaic materials, but already have demonstrated great effectiveness. With all the haste to improve efficiency, some fundamental science questions have gone unanswered. The UT group’s research gained attention due to the creation of a phase diagram for the handling and processing of the perovskite material. A phase diagram is a material’s representation of the limits of stability of the various phases in a chemical system with respect to variables such as composition and temperature, Heben explained. “The reason that this is important is because it will provide a road map for others who want to work in this field, and help those currently working in the field to understand and improve upon the results they already have,” he said. In the past month, the article has been one of the top downloads from the journal. “Solar energy is booming; the market is growing 30 to 40 percent each year and has been doing so for more than 15 years. In many parts of the country, clean solar energy is already cost-competitive with conventional forms of electricity,” Heben said. For more information about the article, contact Heben at Michael.Heben@utoledo.edu. This entry was posted on Wednesday, August 26th, 2015 at 3:01 am and is filed under Natural Sciences and Mathematics, News, Research, UToday .